Tree Services in Columbus | Tree & Stump Removal, Trimming, Costs, etc. Costs – Do you know how much you’ll pay for tree maintenance or removal when it comes time for landscaping season in Columbus, Ohio? We have the prices and costs statistics gathered together for you to know ahead of time, along with information on costs for stump removal, so you can keep a price in mind when consulting with professionals. FAQs – Depending on how long you’ve lived in Columbus, you might not know about city regulations when it comes to power lines or what they expect of your tree maintenance. Learn more about the common trees in the area, diseases to watch out for, hard to maintain trees and plant hardiness by zone for the state of Ohio, among other tidbits about Columbus tree culture including the state tree, tallest and shortest tree in the city and the most common ones you’ll spot. Services – Learn more about what will go into keeping your trees in prime condition. We have a list of the professionals in your area that you can speak to right away. How Much Do Tree Services Cost in Columbus? When landscaping season rolls around in Columbus, Ohio, often the last thing homeowners want to bother with is removing trees, stumps and shrubs from their properties. This process, however, is crucial to the good health of your lawn and garden. Diseases jump from plant to plant, and one bad stump can infect healthy areas. Want to stop the cycle before it begins? Engage in a little routine maintenance and you might be able to save a troubled tree before it’s too late. Of course, tree removal can come with a cost. Here are the latest price breakdowns for local tree removals and maintenance services in the area, so you can get a feel for the fees before you plan your projects. How Much Does it Cost to Remove a Tree or Shrub in Columbus? We’ve found that Columbus residents pay an average of $542 for the trimming or removal of trees. Bear in mind, however, that every project is different. You could see costs as low as $432 or as high as $652. Talk to your landscaper about your property’s specific requirements and be sure to ask whether you’ll need to pay additional fees for travel, splitting or chipping. How Much Does Stump Removal & Grinding Cost in Columbus? Left with an unsightly stump after a recent tree removal? Local professionals can take care of that for you, but you should expect to pay between $78 and $140 for the grinding of a medium to large stump. A word of advice: don’t forget to request specific numbers for sales tax, contractor costs and local inspection fees. Stump removal is also comparable, where you could pay $100 to have it uprooted, unless it is of an exceeding thick circumference or made of a specific type of wood that makes it hard to get out of the ground because of very strong roots. The arborist will discuss the process and break down the quote with you when he comes out. How Much Do Tree Trimming and Pruning Cost in Columbus? We recommend that owners budget between $343 and $429 for basic trimming, cutting and pruning services, but your costs might vary by up to 30 percent if you have especially high or hard-to-reach trees. At the same time, if you have very few trees in your yard, or they have few branches on them that need regular maintenance, you can budget on the lower end of that estimate and have the arborist come out less often to trim the trees. The average that’s best to save up is $386. Located in the heart of Ohio, Columbus is a Tree City, USA. Its gorgeous green spaces and vast park systems make this city a fantastic place to spot iconic tree varieties, and the seasonal climate is perfect for a range of species. What are the basic rules and regulations for trees in Columbus? Regulations vary throughout the city, so be sure to check your neighborhood laws before you hire a tree removal service. In general, all homeowners are responsible for removing and maintaining the trees on their property. You likely won’t need a permit for tree services unless your project is especially large or the tree is located on a public right-of-way; in that case, you’ll need to apply for removal. Keep in mind that the city of Columbus considers it unlawful for dead or diseased trees to remain on your property if the trees pose a risk to public health, peace or safety. If you’re unsure whether this part of city code applies to you, contact the Columbus Recreation and Parks Department. When it comes to routine maintenance, there are a few things to keep in mind. First, be sure that your trees don’t interfere with pedestrian sidewalk use, prohibit vehicular traffic or obstruct street signs. Secondly, you’ll need to remove any tree that’s in danger of falling onto a right-of-way; maintenance won’t be enough to satisfy the city code. Lastly, it’s illegal to severely cut any tree that’s considered public unless its been damaged by a storm or is growing into power lines. In terms of trees and power lines, the Ohio State University Extension Office recommends planting trees at least 15 feet from any power lines. If you can’t avoid planting closer, however, you’ll need to keep the trees under 25 feet tall. Trees growing taller than 40 feet should remain at least 35 feet from any lines. What’s the best month for removing my tree? Columbus’ weather is incredibly unpredictable, but there are a few times of year that bode better for tree removal than others. May is generally a dry month with warmer temperatures, but the demand for tree service can be higher and the fees more expensive. If the weather permits, schedule your removal for April or October. These months are the best climate-wise, as well as a good time for getting the tree uprooted from the ground or for heavy pruning and maintenance. What trees are difficult to maintain in Columbus? In general, the most difficult trees to maintain are ones not native to Columbus palms, avocado and lemon trees. You will, however, have better luck with low-maintenance trees like river birches (Betula nigra) and white fringetrees (Chionanthus virginicus). Of course, you’ll also need to keep local regulations in mind. Honeysuckle (Lonicera), for instance, is becoming an invasive problem in Columbus, and the city is currently advising against planting it in any public space. Contact the Columbus Recreation and Parks Department if you’re unsure about a specific tree. What type of trees thrive best in the Columbus climate? Ohio’s fluctuating temperatures limit local trees to those that can handle a variety of weather conditions. According to The Columbus Dispatch, evergreens like the Black Hills white spruce (Picea glauca) and Chalet Swiss stone pine (Pinus cembra ‘Chalet’) do especially well in the city. 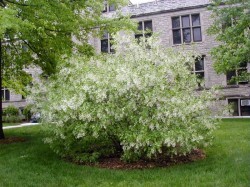 While old standards like oaks, ashes and maples flourish in Ohio, you’ll also have quite a bit of luck with the Persian ironwood (Persian parrotia) and beautiful, white-flowered serviceberry (Amelanchier). The state tree — and beloved college team — is the buckeye (Aesculus glabra), which also thrives well in Columbus’ climate. Columbus is an incredibly green city, and a number of tree varieties grace its streets. 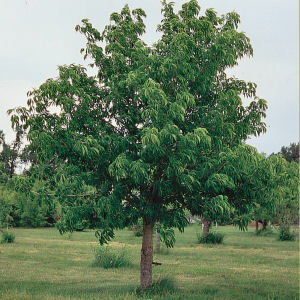 Try planting the white ash (Faxinus americana), American beech (Fagus grandifolia) or flowering dogwood (Cornus florida). Are there any tree diseases common to the area? Though you’ll occasionally find rare epidemics in city trees, the most common diseases are the minimally damaging powdery mildew and leaf spots. Found on species like dogwoods and English oaks, powdery mildew gives your tree leaves a strange, powdery look. Yellow-green tar spots are common among maples, and the frogeye leaf spots attack crabapples.